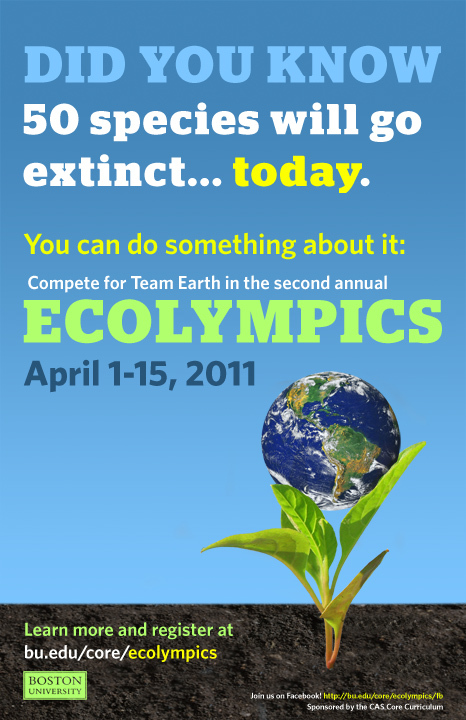 The second-ever Ecolympics, April 1-15, is going to be bigger and better than last year’s, and you can help: by contributing to the Core Eco-quotes Project. As you know, Core is about tackling the big questions in life and certainly one of the biggest these days is how can humans best live with and within their surrounding natural environment. For students, after one or three semesters, your readings must have already touched on this question numerous times. For faculty, you must have a list of favorites! Please send your favorite eco-themed quotes to the Core email account, and we will post your contribution as an analect here on the Core blog, and incorporate your quotes on the Ecolympicss homepage.